In the year 1811, a most spectacular discovery was made in an orchard at the village of Negau (today Ženjak) in Slovenia. 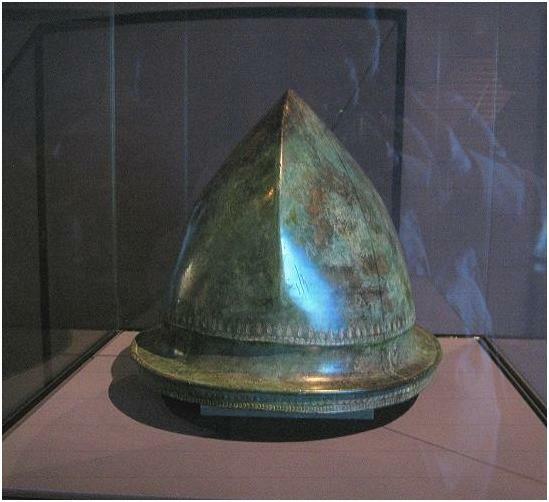 The Negau Hoard, consisting of 26 bronze Etruscan helmets, many bearing inscriptions in a Celtic script, represents one of the most important archaeological finds in this part of Europe. 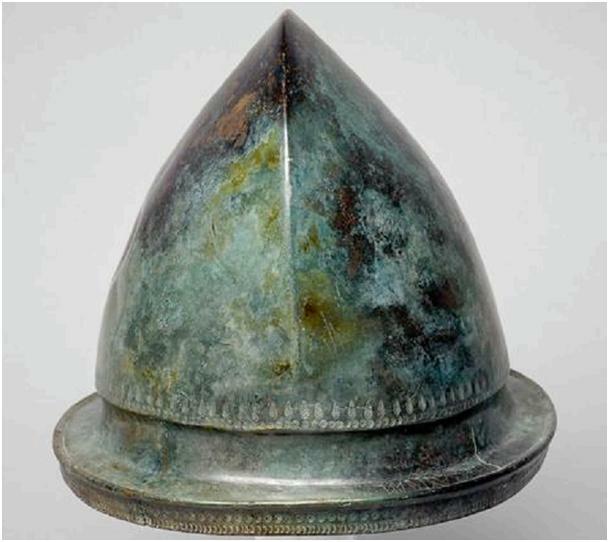 The helmets are of an Etruscan design from circa 500-450 BC called the Vetulonic or Negau type, which are of bronze with a comb-shaped ridge across the skull, and a protruding rim with a groove right above the rim. However, the inscriptions on the helmets are believed to have been added at a much later date (2nd c. BC), and the deposition has been dated to circa 50 BC – i.e. shortly before the Roman conquest of the area. 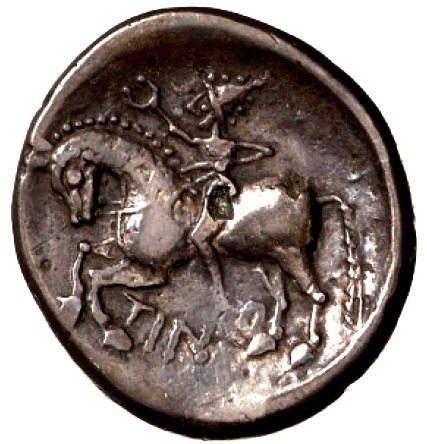 Reverse of a Celtic tetradrachm from eastern Hungary (2 c. BC) depicting a horseman holding a torc – a symbol of high status and power in Celtic society, and wearing a Negau type helmet. 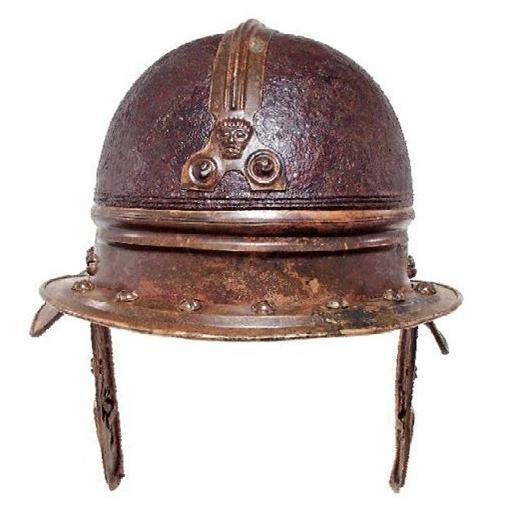 As mentioned, the deposition of the Negau Hoard has been dated to circa 50 BC, when such helmets had long been obsolete, having been replaced by more modern equipment such as the Novo Mesto type helmets (below). 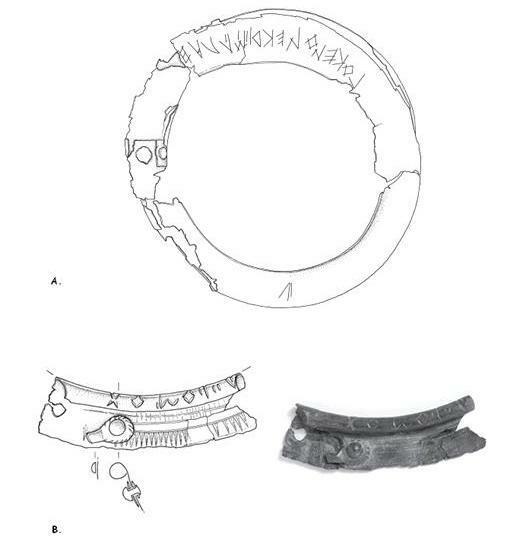 It appears that after becoming redundant the Negau helmets took on a ceremonial / religious function, as attested to by the Celtic inscriptions on the helmets, which bear the names of priests/druids (see Markey T. (2001) A Tale of Two Helmets: The Negau A and B Inscriptions. In: The Journal of Indo-European Studies, Volume 29, 2001; Must G. (1957) The Problem of the Inscription on Helmet B of Negau. In: Harvard Studies in Classical Philology Vol. 62, (1957), pp. 51-59). Increasing evidence of the use of a Celtic script on the Balkans, based on the Etruscan alphabet, has come to light in recent years, and indicates that this alphabet continued to be used throughout the Roman period. 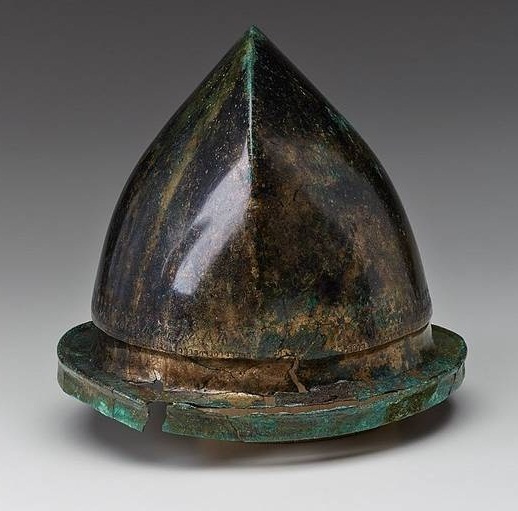 The majority of the Celtic inscriptions on the Negau helmets are structured: name + ‘the diviner’, name + ‘astral priest of the troop’, while an inscription on one of the helmets – the so-called Negau B helmet, has attracted particular attention. According to linguistic analysis, it contains the Germanic name *Harigasti(z), which consists of two parts: hari = army, host (found in Old Norse herjan – to make war, to plunder, hernað – warfare; or in German Heer – army) and gasti(z) = guest. The second part of the inscription has been interpreted as *teiwa(z) = god. Thus the inscription would read: “Harigasti, [the priest of] the god” (Markey 2001). 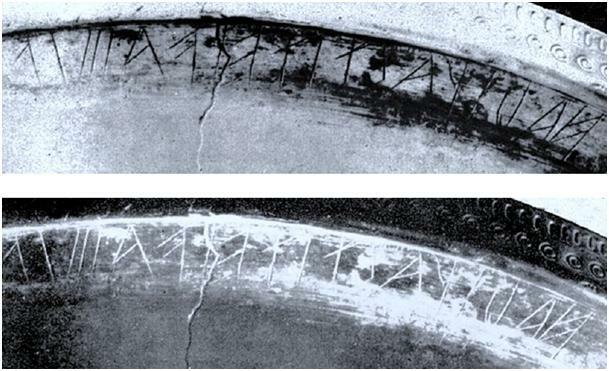 If such analysis is correct, this would represent the earliest recorded Germanic inscription. I don’t believe that this is a Celtic script. There are too many differences from the standard Celtic script. And which ‘standard Celtic script’ would that be? Another possibility could be the ‘grim’ aspect of a male triple-divinity – something akin to the ‘lucky-ghastly’ heads used as part of the Krampen guising traditions in more modern times in north & central Europe, even? Perhaps even the souls of the fallen who are unhappy because of being forced to join the ‘wild hunt’ or ‘slog si’ instead of getting a good reincarnation or access to the blessed fields?